London take note, what you are about to read is the art of brunch from the master of this fashionable meal which sits somewhere between breakfast and lunch. Melbourne does brunch, and it does it bloody well. 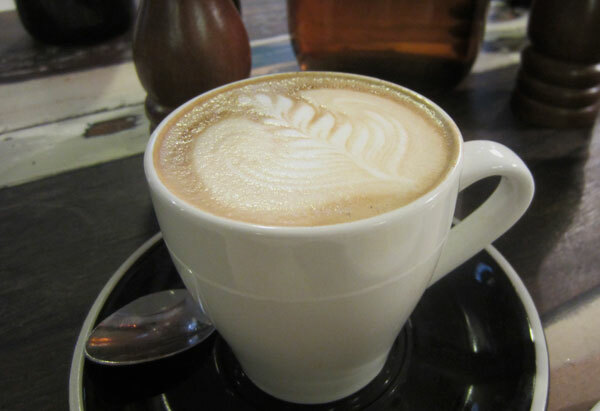 Being a former resident I am very well versed in the cities bruncheries but on my recent return I really was spoilt for choice of new, delicious, down right cool and oh did I mention the coffee, you can brunch on every corner of this fine town. So here is the low down of where I munched, mouched and brunched. Mainly in the north-eastern parts of Melbourne, which lets be frank is the place to be! My old ‘hood of Collingwood just keeps getting cooler. It is probably the Shoreditch of Melbourne but with not so many hipsters and more cashed up creatives. De Clieu sits on Gertrude St and is easily spotted by the crowded street side tables of brunchers. 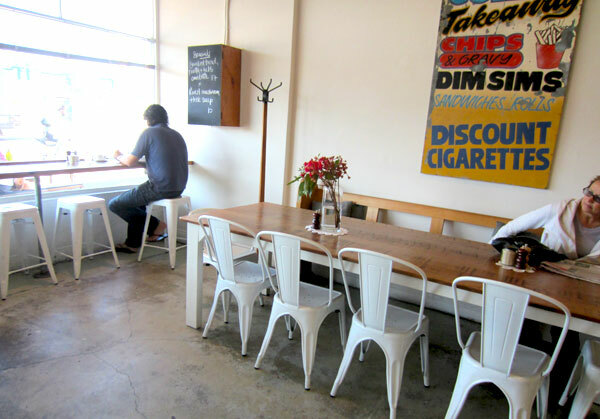 This cafe is one of three in the Seven Seeds coffee dynasty. 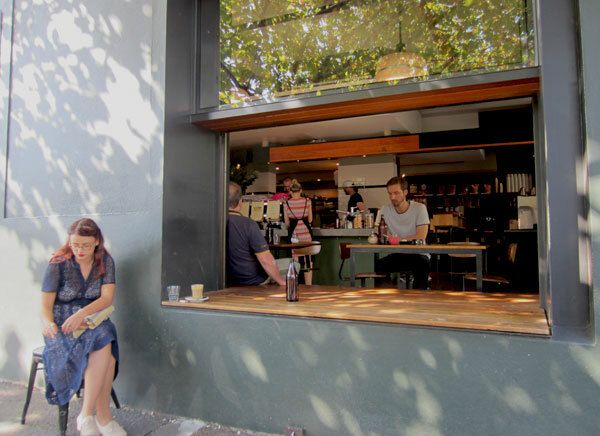 Which according to those in the know is the shizzle of the Melbourne coffee scene. The menu has a slight French feel to it and grouped into breakfast, brunch and lunch which you can basically chose from all day. Breakfast choices on the menu such as chai infused porridge with rhubarb compote & vanilla mascarpone would normally have me drooling all over it in London. 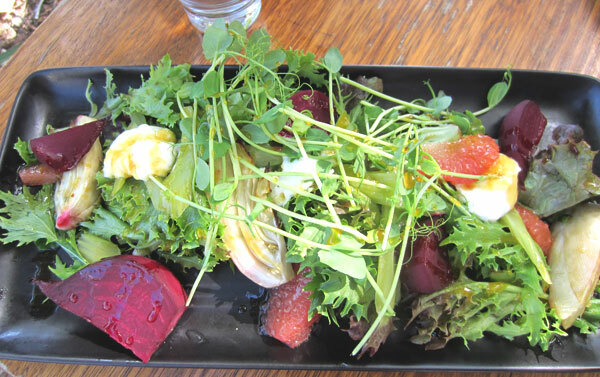 But being a sunny autumn day in Melbourne I thought it was more appropriate to order a warm salad of beetroot, slow cooked fennel, apple infused celery, goat’s curd, walnuts, grapefruit, mixed leaves & orange reduction. It was super fresh with the citrus finish and the slow cooked fennel giving a slight aniseed flavour. Light but so tasty and with a creamy latte on the side the perfect brunch. 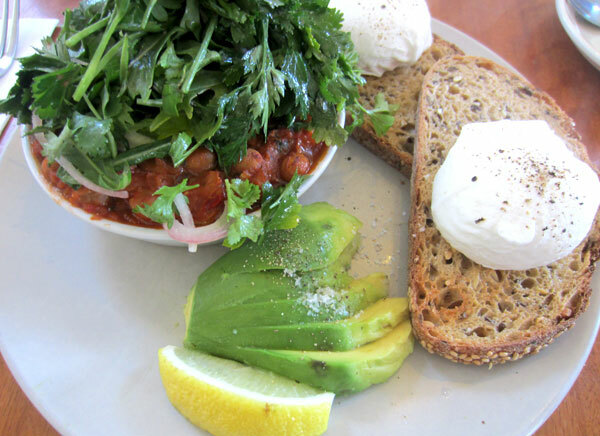 The next hidden gem on the Melbourne brunch off was Mixed Business in Clifton Hill. Located on the very end of Queens Parade, don’t let the traffic put you off as once inside the smell of roasted coffee and fresh bread will soon have you weak at the knees. And to add to this concrete cool interior there is the most wonderful side garden with a single row of tables to soak up the sunshine and eat amongst the fragrant herbs and the most laden lemon tree I have ever seen. The menu is brief but I could have ordered one of everything. The hot rolls got my attention with scrumptious fillings to suit everyone’s liking. 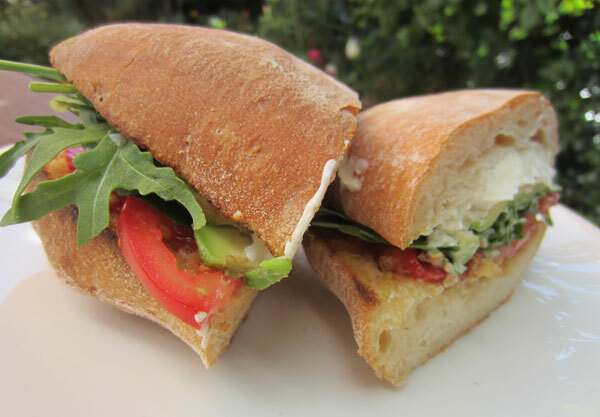 A crusty sour dough roll was packed with avocado, tomato, olive tapenade, soft goats cheese and rocket. It was simple but so delicious. It’s also very difficult to leave Mixed Business without a sweet treat from the counter. Muffins bursting with blueberries, rhubarb and custard slice, and chocolate chunk cookies longingly look at you saying, ‘Go on, I’m just a mini treat’. Tucked away in the beautiful residential streets of Fitzroy North you may just be lucky enough to stumble across Mitte, and you will be so glad you did. A small space sitting unassumingly on a corner, it offers more seating on the street than it does inside. I am sure the local residents would like to keep this little gem to themselves but I would be willing to travel across town for this brunch. Hell I even crossed a hemisphere. Mitte epitomises what I call brunch. The menu is quite extensive for such a small establishment and covers all of the brunch categories; sweet, poached eggs with the most amazing sides, omelettes and toasted sandwiches. I studied the menu for a good 15 minutes, wiping the drool from the corner of my mouth as I antagonised over what to order. Yes the omelettes sounded amazing and as pictured above, a triple cheese omelette with mushrooms was a great choice from my fellow bruncher. If I could design my perfect brunch, this would be it. It has all of the elements which really get me excited about eating food at this special time of day! Two perfectly poached eggs on multigrain toast, a side of avocado and the most phenomenal chickpea bake in a rich and spicy tomato sauce, topped with goats feta, red onion, and so much rocket and parsley you had to fight your fork though it. And the best part, it was drenched in lemon which gave it the most divine smell and fresh taste. This is brunch heaven. And I have actually been dreaming about this dish ever since. Mitte you get the crown of Melbourne’s best brunch. 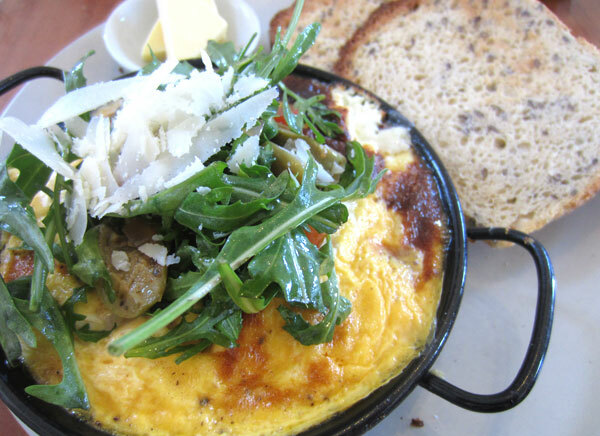 A few more notable stops on my brunch circuit were Pope Joan in Brunswick East. A very unnotable location on Nicholson St but the cafe is definitely worth a visit. A gorgeous outside eating area and kitchen garden, where some very healthy rhubarb is doing its thing. The menu is interesting with brunch items like spanner crab omelette with coriander and chilli salt. And the selection of gourmet sandwiches will cure any Sunday hangover. Dench Bakers on Scotchmer St in Fitzroy North bake the most amazing bread and pastries on the premises and have a great selection of focaccias and quiches to brunch on. If you are doing a spot of retail therapy in the city of Melbourne you need to ensure you take a break to rehydrate. Known for its hidden laneways Melbourne is hard to discover without a knowing local guide. Manchester Press is tucked away on Rankins Lane just off Little Bourke Street and is a super cool spot to drink your latte. The menu of big salads, sandwiches and a mouth watering selections of cakes will also fuel you for an afternoon of serious shopping. And so Melbourne your brunch is hard to beat, you know your poached eggs, you always have avocado on the menu and your coffee is the best I know. London you have a lot to learn.